The face needs a new mold. He looks sullen. Dead, even. Why can't they just adapt the Kotobukiya face? Not for a hundred bucks. $100 is how much this thing costs? I considered it till I noticed the price. That's not $100 worth. Neither was that damn soundtrack set worth the buck it was. I'll take my money elsewhere. If it looked better I would consider it. Im honestly happier with my D-Arts figure. It's smaller, sure, but the details are much MUCH better and the face really matches his official look. @Anon 1: Isn't that his current status? But seriously, while overall it looks great, his face needs some work. For $100? Not a chance. I'll use the $100 for that Sigma statue. That'll be one hell of a purchase. I'm more than content with it. I think we're spoiled by the Kotobukiya/D-Arts figures. Those who remember seeing photos of Rockman model kits in Nintendo Power and dreaming of having Megaman toys of their own one day know not to take these things for granted. 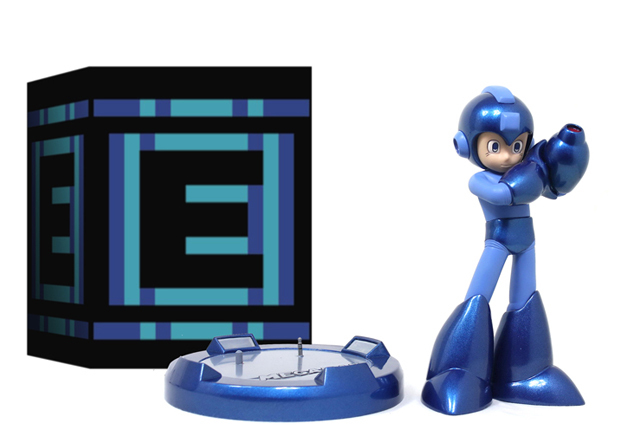 The face could be better like the Japan figures, but it could be worse like the MvC Megaman figure. And considering the time and effort I put into acquiring a Megaman 10th anniversary statue, I'm going to get this one while the getting's good. When it fails to even clear the preorder expectations Capcom will use it as more evidence we don't like Mega Man. The face just really doesn't look good, let alone correct. If it was at least smiling or expressing some kind of positive emotion, it would at least be bland, but okay. With that cold, dead face though, I can't give this thing a pass. I'm also not really excited by the oddly metallic paint job. Given the option, I'd be happiest with the strait blue colours that I know. Overall, definitely not a worthy way to spend $100. I really like it, and seldom give much thought to buying these kinds of novelty items, but I was initially thinking it would be cool on my computer desk with the usb lighting! $100 is pretty absurdly steep though. With the original face and paint, I'd spend up to $75 just because I don't ordinarily buy these trinkets. It's a justifiable expense. But with THAT face and the bland paints, there's no way I'd buy that. Whoever was in charge of overlooking the quality of this figure really needs to look for employment somewhere else. :/ Like I said in a previous post, the face isn't too awful, but for that kind of price, I would expect the quality to be a lot better. By quality, I mean as little errors as possible. For $100, I want it to be almost perfect. You can get a D-Arts figure for a third of the price and those figures look great. This particular statue looks like it was rushed so that our "friends" at Capcom could make a quick buck with limited figures. They could have had a lot of our money, too, if it weren't for that damn face job. Sorry Capcom. You guys tried. If it's too late for revisions, then I may just cancel my order, actually. I placed my order based on what I saw originally, now it's turned into something that, in an area that counts, is worse. If they revert it, then it'd be fine for me, but as it stands...idk. Hey, proto you buying? I just bought a copy anyone who doesn't is not a Mega Man fan. The 10th Anniversary statue looked better. That was for the 10th. It STILL had a better face than this one. That's really the only bad point on this. The really bad face. It's not something super hard to get right, yet somehow they've failed spectacularly, and then made it WORSE. Well what could better summarize the state of all things Megaman circa: 2013 than Total Neolithic Incompetence? It's rather fitting in a way to immortalize it in a "flawed" statue, don't you think? Did you recently buy that 10th anniversary statue that was on eBay for several months? The one listed originaly at $150, and then dropped to $110? @Prof Megaman: It's called having standards. No I bought mine in 2011 and I paid $74. "Standards"? Preaching to the choir on that one. Sometimes I feel like one of the only people here who still champions standards. And be honest. folks. This is hardly the ugliest Megaman you've ever seen. Not by a long shot. Well it's not $100 worth of quality, either. Much less components and labor. Setup, maybe, but that's awfully inefficient.